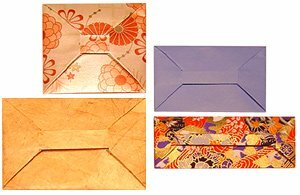 This origami bar envelope is a great traditional model with as many uses as you can think of! Think about it... what could be more practical than being able to construct an envelope out of a single sheet of paper, with no scissors or glue? Give it a try, you'll love it! For a printable pdf version of the envelope instructions, click here. 4. Fold bottom edge to this crease just made, then fold upwards again. downwards to the point shown. the bottom fold as shown. corner triangles as a guide. Open out again. creases within the rectangles as shown. 9. Open out the corner triangles and open up the fold along the crease shown. Model should now look like this. 10. Using existing creases, fold edge inwards and flatten bottom corner triangles as shown. 11. Fold top back down along existing crease. 12. Fold edges inwards, bringing corner triangles outward and down as shown. 13. Tuck corner triangles in on themselves. 14. Make creases as shown: top corners down to crease. Then open. 15. Holding the envelope at the points shown, bring this point down and inside the envelope, as shown by the arrows. The creases should guide the way. Flatten model. 16. 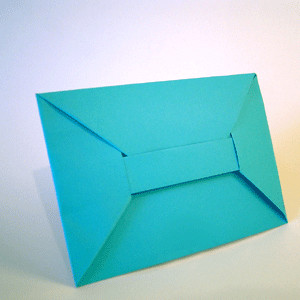 You can close the envelope by folding the top down along existing crease and tucking in.